IREKA Corp Bhd plans to launch projects worth RM1.9 billion over the next five years as the company is upbeat about the prospects of the real estate sector, despite the sluggish global economy. The upmarket developer is planning to launch two projects by end of this year. The projects are for a boutique hotel and serviced residence in Kuala Lumpur and a housing development in Nilai, Negri Sembilan. 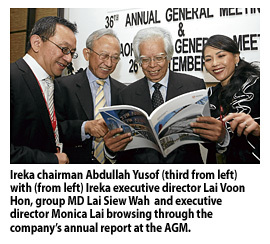 Ireka's group managing director Lai Siew Wah said the boutique hotel and serviced residence project is a 30:70 joint-venture between Ireka and Aseana Properties Ltd.
Lai said Ireka is looking at diversifying into the mid-market residential and commercial sectors, as well as modern industrial buildings. "The residence project will serve as the niche market for luxurious residential units with smaller built-up, 80 per cent of which are 878 sq ft and 906 sq ft," he said. Speaking at a media briefing after the company's annual general meeting here yesterday, Lai said, the company expects revenue from the property development projects to roll in within two years. Also present were chairman Abdullah Yusof, executive director Lai Voon Hon and chief financial officer Monica Lai. Meanwhile, Lai said Ireka is currently eyeing more construction jobs here. The company has RM745 million worth of ongoing projects, of which about RM400 million remains outstanding. Among the ongoing projects are works for the City International Hospital in Ho Chi Minh City, Vietnam, two office towers and a hotel block in KL Sentral as well as a high-rise serviced apartment and office project - the Imperia Puteri Harbour - at Puteri Harbour in Nusajaya, Johor. In the current financial year, the group will continue to focus on replenishing its order book, Lai added.